The KineMatik Electronic Lab Notebook (ELN) helps researchers capture, manage, find and reuse research data faster. Share data from multiple research projects and collaborate across local and global research sites. Protect Intellectual Property and support compliance with regulatory GxP guidelines. Available as on premise or in private cloud, there is a deployment plan to suit your IT requirements. See HERE a recording of this webinar and see the value from the latest release of the KineMatik ELN. Modern responsive browser interface with easy digital capture of forms, documents and data. A powerful search engine including full text, meta data or natural language search capabilities across documents and any enterprise files. Templates save time, improve consistency and enable the re-use of experimental information through standardized data structures. 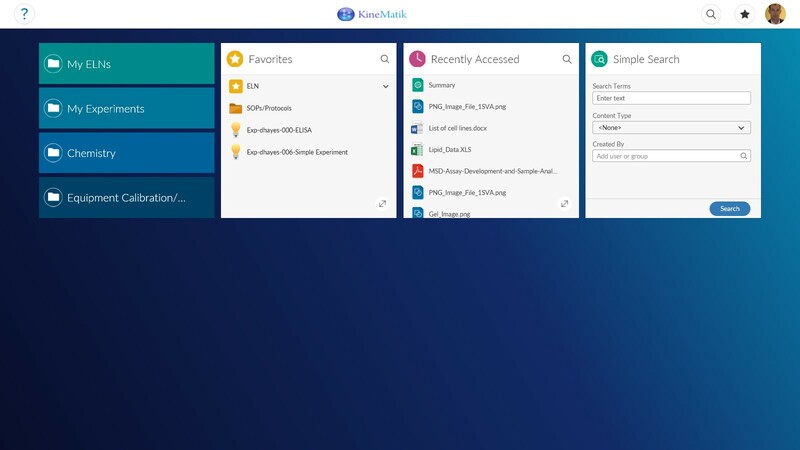 The KineMatik ELN is built on a proven Content Management platform, OpenText’s Content Suite. It now supports Content Suite 16 and the Smart UI and provides the ability to integrate the ELN directly to enterprise software including SAP, Oracle, MS SharePoint and more.